BUTLINCAT's BLOG: WIKILEAKS UPDATES 23 JULY 2018 - SNUBBED? ASSANGE EVICTION IMMINENT? WIKILEAKS UPDATES 23 JULY 2018 - SNUBBED? 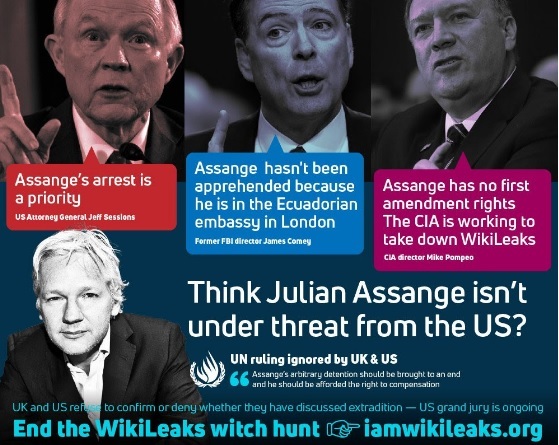 ASSANGE EVICTION IMMINENT? ... of General Dostum's violence and sexual abuse, and diplomats and American Embassy cables released by WikiLeaks have detailed even more. Update Tuesday S Wikileaks Announcement Moved Due To Security Threat ... Watch New Julian Assange Wikileaks Interview About Hillary Video. What happens when the 88GB Wikileaks insurance file is decrypted? What happens when the 88GB Wikileaks insurance file is decrypted? mobile.twitter.com. 3 points by HuckFackerNews an hour ago. Ecuador to hand over Assange to UK 'in coming weeks or days,' own sources tell RT's editor-in chief 'Ecuador is ready to hand over the WikiLeaks. Getty Images. Wikileaks founder Julian Assange speaks on the balcony of the Ecuadorian Embassy, ​​where he has been taking asylum since 2012.